Last Saturday night marked the first time in four years that Five Stories High, an original rock band partly made up of UMaine alums, played out in Hoboken, New Jersey. The idea of an FSH reunion show was prompted when the band learned that their lead singer and resident superstar, Merrit David Janes (a.k.a. DJ Tanner, Class of ‘03), would be in New York City this Fall preparing for his part in The Phantom of the Opera North American Tour. It was a rare chance to get all four members together that was not to be missed. 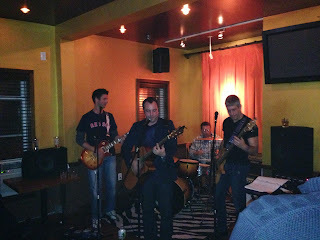 Five Stories High was first formed in 2001 as a country, rock, funk, fusion band in Hoboken. The original members were Juan Araya (bass/guitar), Corey Rudolph (guitar/vocals/trombone), Kevin Dibble (drums), Arie Moller (guitar/vocals/bass/harmonica), and yours truly, Keith Luhmann (guitar/vocals/bass). The band gigged mostly in New York City, frequenting legendary West Village venues including The Elbow Room, Kenny’s Castaways, and the Baggott Inn. Now back to the future, with only a small window of time available, the band was able to work with Mr. Joe Jones at his bar, Carpe Diem, to set up the reunion gig in his private upstairs party room (highly recommended for your next event by the way). With an open bar and Joe on stein duty, any rustiness that might have been apparent was well smoothed over as we plowed through a boisterous set…and as a bonus, the World Series game was on in case people needed a rock break. It was a perfect evening (aside from the infamous “obstruction” call that is) shared with an enthusiastic group of family and friends that will not soon be forgotten…though no date has yet been set for the next reunion gig, the band hopes there won’t be another four years until Five Stories High once again makes a triumphant return to The Garden State.